Linkam’s cryo-stage is chosen by JPK Instruments for their NanoWizard® AFM systems. 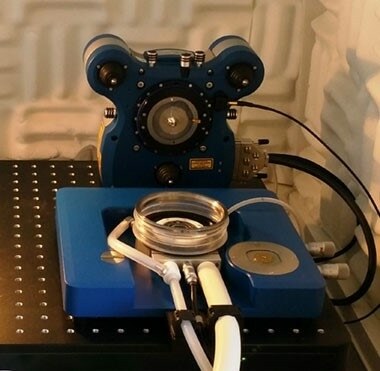 Market leaders in temperature controlled microscopy and established manufacturers of advanced freeze drying microscopes, Linkam Scientific Instruments, have been chosen by JPK Instruments to supply a customized version of one of their cryo-stage systems to enable surface properties to be studied over an extended temperature range. Linkam has been developing cryo stages for correlative microscopies for many years while JPK Instruments is regarded as a leading supplier of nanoscale resolution SPM & Optical Tweezer systems. Bringing their technologies together has enabled JPK to offer cryo-stage capability for their NanoWizard® AFM systems. This means AFM users may now study surface property changes as a function of temperature over the range of -120 °C to +220 °C. JPK reports on the retrovirus research of Professor Itay Rousso and his colleagues at Ben-Gurion University in Israel using the NanoWizard® ULTRA Speed AFM. JPK reports the research of the Schwille Group at the Max Planck Institute of Biochemistry near Munich using the NanoWizard® ULTRA Speed AFM. The JPK Instruments CryoStage has many applications in material science and life science. For example, the broad temperature range helps the study of several phase transitions of polymer films in one experiment observed on the nanometre scale. The imaging of a crystalline polyethylene film at -120 °C has been performed. Details of this and other experiments may be found in application notes on JPK's web site. Electrical and magnetic changes of surfaces may also be studied with varying temperature. These and other applications of thermal property studies such as cryopreservation will be looked at in future work. The main alternative to the Linkam stage technology was for us to design a completely new product. However, we could significantly speed up the development by using the well-known and respected products from Linkam. As a result, after careful project planning, JPK Instruments selected Linkam’s technology and no other commercial equipment was evaluated. The main benefit of the Linkam stage was that it was a completely finished product on the market with almost precisely the ranges and specifications JPK Instruments needed, e.g. temperature stability of +/- 0.2 °C. Linkam was also known to some employees at JPK Instruments who had good experience working with Linkam in the past. High-resolution AFM on a stage with cryogenic nitrogen pumps required some adjustments on the stage support in order minimize temperature drift. The adjustments were only possible due to the good Linkam technical support. In addition, the ergonomic, user-friendly control of the Linkam stage gave the product a modern finish. To learn more about Linkam and their approach to the development of temperature stages to address multiple applications challenges, please visit www.linkam.co.uk.